She's been known to vomit because of the pressure before races, but Mikaela Shiffrin has credited a change in her mentality as key to her tearing through the record books. 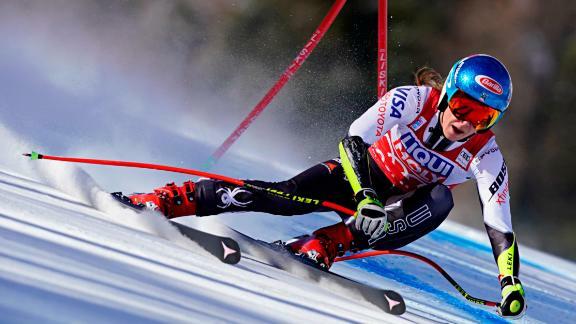 Shiffrin continued her dominance of women's ski racing with an 11th win of the season in Cortina d'Ampezzo, Italy Sunday -- a mastery of her sport that has had even double Olympic champions hailing her as from "another universe," and made the sporting world outside skiing take notice. But despite the constant questions, interviews and articles about records, Shiffrin has managed to quell the nerves and look beyond the expectation to focus on her racing. "I used to feel like there was a target painted on my back and I hated that feeling because there was so much pressure," she told CNN's Alpine Edge in Cortina. "I prefer to feel like I'm chasing, and I've somehow found a way to have that mindset, even though I'm not always the one who is chasing. I'd rather be hunting than hunted." The 23-year-old American has won nine of her last 12 races, and her 11 wins in 18 starts this season have taken her to 54 World Cup victories -- that's more than a third of the races she's started in. Her overall tally leaves her one behind Swiss Vreni Schneider, who is in third on the women's all-time list of World Cup winners. American great Lindsey Vonn, who is set to retire later this year if not before through injury, leads the women's standings with 82 wins, four shy of Ingemar Stenmark's record. Shiffrin has time on her side to amass plenty more. At the Olympics last February, Shiffrin was talked about as capable of winning five golds, but after winning the giant slalom crown the nerves and pressure of expectation contributed to her missing a medal completely in her favored slalom event. She later grabbed a consolation silver in the combined. This season, however, she has been a revelation. She has become the first skier -- male or female -- to have won 15 races in a calendar year. And she is four wins short of the single-season record of the most wins in a season -- Schneider won a record 14 races in 1988-89. "Sometimes it's a little bit more difficult to stay focused when everyone's talking about records, records, records but this year's it's been pretty fun," Shiffrin added. "I like to talk about it but it hasn't become my huge distraction. I feel honored but there is no pressure." Even double Olympic champion Ester Ledecka, who stunned the winter sports world with twin golds in skiing's super-G and snowboarding's parallel giant slalom in PyeongChang 2018, is awestruck by Shiffrin's performances this term. "It's hard to explain in words, you know, she's like she's from another universe," Ledecka told CNN's Alpine Edge. "She's an extraordinary ski racer, she's just like a robot." Shiffrin enjoys a commanding lead in the overall standings, 496 points ahead of her nearest challenger, Slovakia's Petra Vlhova, and is on course for a third straight World Cup overall crown.